All Blue Lagoons Iceland Reviews will tell you that it gets VERY busy. We booked over a month ahead. When you book you need to nominate a time. If you nominate say 1 pm you can then enter anytime between 1 and 2 pm. There are separate queues at reception for pre-book vs on arrival and for the different package types. There are 2 options for lunch at the Blue Lagoon. There is the Blue Lagoon café and then the Lava restaurant. 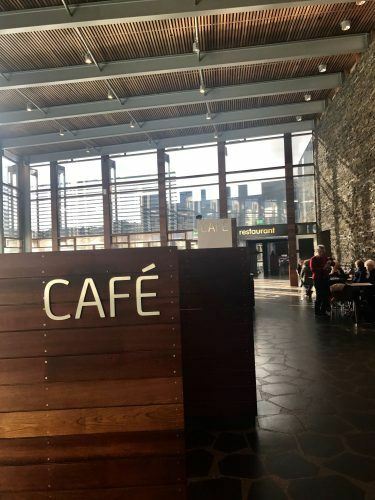 The café is like a typical sandwich type café with pre-prepared sandwiches, sushi, drink etc. The Lava Restaurant is the more upmarket option. I highly recommend having lunch here. 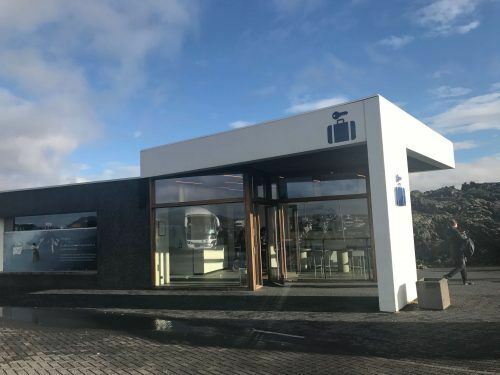 It is a beautiful restaurant – decorated in a stylish Icelandic fashion. It also has large glass panes so you can see the lagoon. But most importantly the food is absolutely delicious! This was one of our highlight meals of the trip. 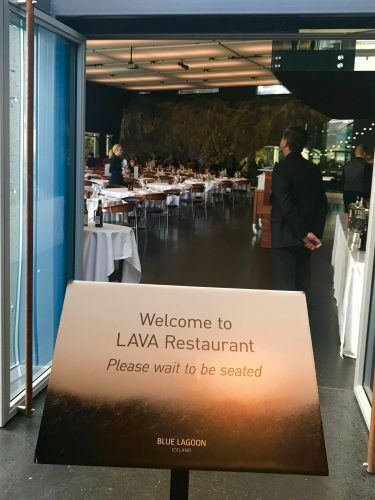 Welcome to the Lava Restaurant! 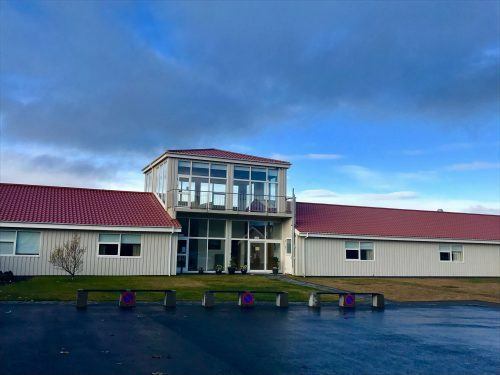 Lava has a short a la carte menu or a good value (for Iceland!) set menu option. For 6600 ISK you can have 2 courses and a glass of prosecco. 3 Courses are 7700 ISK. We went with the 2-course option and that was more than enough! 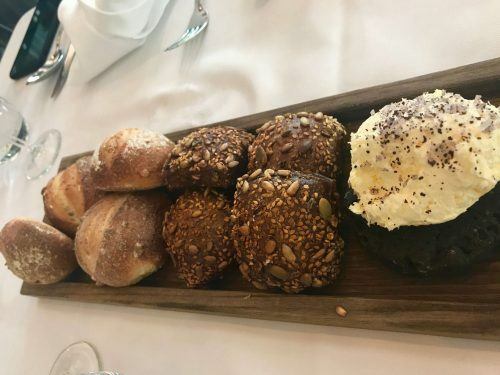 After ordering they bring out the most delicious and warm bread options – 2 per person. These are served with this amazing skyr butter which sits on a black pumice stone (which I initially thought was black bread!). These rolls and the butter were amazing! Skyr butter – to die for! 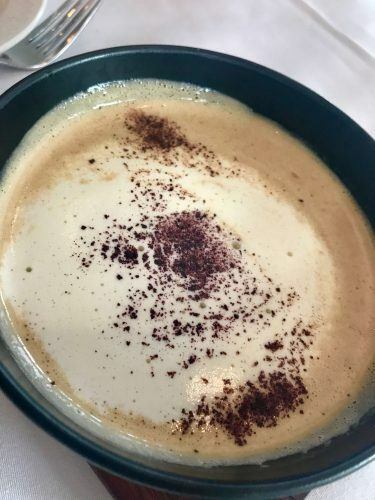 I then had the langoustine soup which was absolutely delicious. 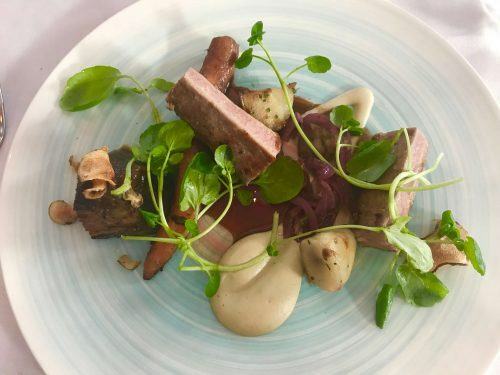 This was followed by the lamb – a lamb fillet and a lamb shoulder served with sunchokes, carrots, pickled red onion and thyme. This was absolutely fantastic. We were all full to bursting! Due to our schedule, we had lunch first and then visited the lagoon. This can easily be done the other way around. 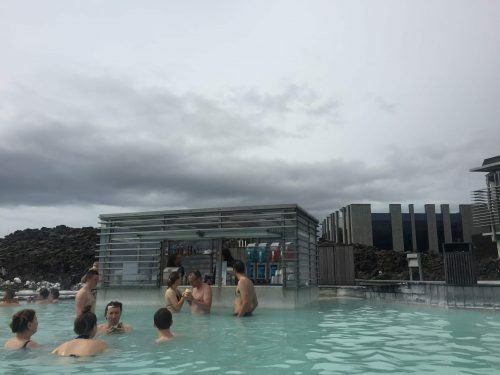 The premium package to me definitely provides the best experience at the Blue Lagoon. You have a preferred queue for arrival and reception gets busy! I then received a plastic wristband to indicate which package I had booked. This is also linked to the credit card you used to book so you can order more drinks etc once in the lagoon. You will then receive a towel, a bathrobe and flip flops (you can keep the flip flops!). These are all things that you will be pleased to have! 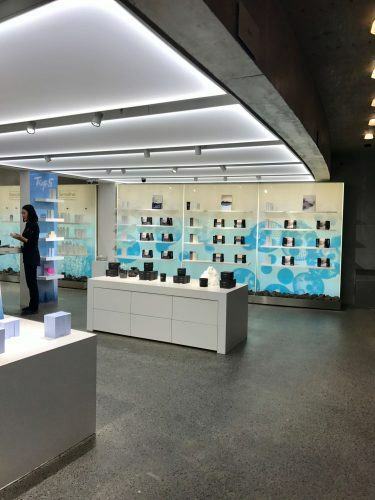 The premium package also includes a free drink at the in lagoon bar (this includes alcohol as well as skyr smoothies) and an extra algae face mask in the lagoon. The premium package costs 10200 ISK per person. There are 2 cheaper options – standard and comfort – but they lack the bathrobe and flip flops! There is then a mega deluxe luxury option which is for 2 people and includes a private changing room etc. The lagoon is quite big! The temperature fluctuates quite a bit throughout the lagoon – although it is from quite warm to very warm! On the edges near the rocks, you can pretty much sit down so these are good places for a rest! As you enter the lagoon the in lagoon bar will be ahead of you to your right. The bar has great skyr smoothies, soft drinks, wine, beer and prosecco. You are allowed a maximum of 3 alcoholic drinks per wristband. You can also buy the waterproof iPhone cases here. Where you can grab a drink or an iphone holder! Opposite the bar is the face mask bar. Everyone has access to the standard white mask. You put this on for up to 10 minutes and then take it off using the water in the lagoon. There is also a lady swimming around in the cutest bathing cap you have ever seen who offers up a blue lagoon scrub. If you have bought the premium package you can then return to the face mask bar and get your algae mask – another 10 minutes. The in lagoon massage area is just behind the face mask bar (see further down this post for details). There are also some little bridges nearby. 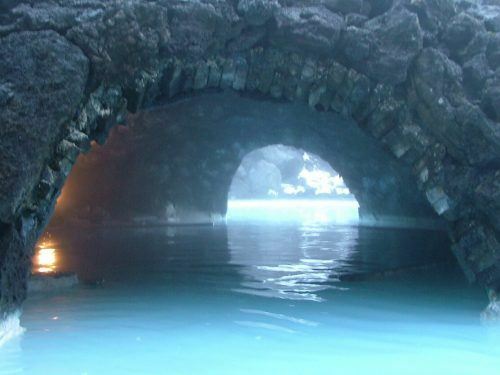 If you go under these bridges there is a hard warm waterfall that is great for neck and shoulders. There are also several steam rooms and a sauna (these involve getting out of the lagoon but are very nearby!). It is then nice to wander the entire lagoon. As you head away from the main entrance to the lagoon you will go under a bridge which has a cold water fountain of a type to help keep you hydrated. It is hard to say the ideal time to stay in the lagoon as it is very much a personal choice. The first two times I went I spent maybe an hour in the lagoon. The most recent I was with 3 girlfriends and we ended up in there for about 3 hours! Serious prune fingers! I will just review the women’s facilities! When you come into the change area there is a long corridor. Along the corridor are little open areas with lockers and a low seat for changing. If a locker is open and empty it is for you! The wristband you have been given will lock and open your locker. Store your shoes outside of this area. Put on your bathers and your bathrobe and flipflops as if you were going to any pool. You are then asked to wash without bathers before getting in the pool. The good news for my more modest readers is that there are individual shower cubicles! The blue lagoon is not great for your hair. In your pre lagoon shower apply the special conditioner in every stall to your hair. You absolutely can put your hair in the water. However, make sure you used the conditioner both before and after your time in the lagoon or you will have very dry hair for a couple of days! So this is what it is like at the blue lagoon! You can then either enter the lagoon from the inside (there are loads of hooks for hanging your robe etc) or from the outside (again more hooks). Each hook is numbered so you can keep track of where you put your towel and robe. 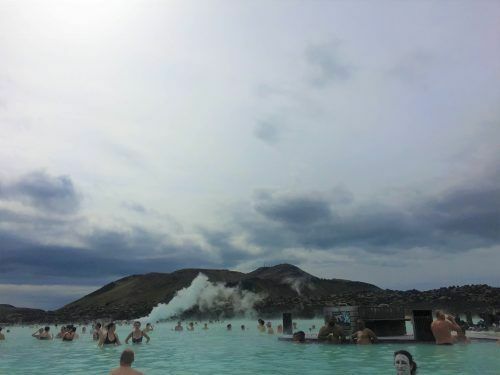 A key question, of course, is how do you take photos in the blue lagoon? Well, you can take your camera and or phone into the lagoon which many people do. Of course, the hand holding it will need to stay above the water. The other option is to buy a waterproof case for your phone. These are on sale at the in pool bar and were very popular. I chose to take my iPhone in quickly for a few snaps and then leave it with my robe. The robe does not have pockets so I used one of the plastic bags provided for wet bathers and tied this up with my robe. It was, of course, the same process in reverse on the way out. There are benches and seats provided with good forceful hair dryers as well as cotton pads etc. There is a chute next to these where you can put your used towel and bathrobe. On the way out you will go through a security area to exit. Just tap your wristband. Part of the console will then open up. Place the wristband on the console and then the barriers will open. If you are looking for something different for yourself or someone you care about definitely check out the Blue Lagoon massage option! If you would like to try the Blue Lagoon Massage you must pre-book or you will most likely miss out. There is a special private area behind the face mask bar. This is where you will meet your masseuse at the appointed time. Now full disclosure that I did not have one of these – but we bought the Blue Lagoon Massage for the girlfriend I was with as a birthday present. She loved it! And we did try to check her out during the massage as it is all outside! She was placed on a lilo type piece of rubber and then covered in warm wet towels. The Blue Lagoon massage covered head, hands, feet as well as shoulders etc and she raved about it. Everyone else coming out looked very happy! I’m not sure there is anywhere else in the world that offers an in lagoon massage!!! 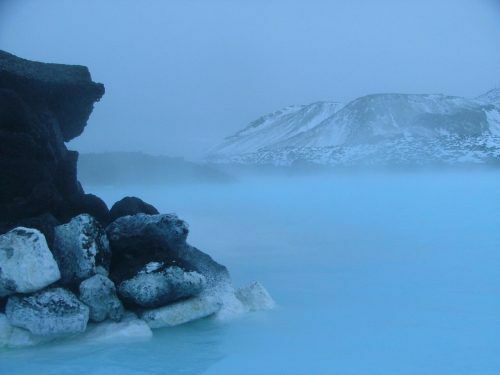 The Blue Lagoon can easily be reached from Reykjavik or from Keflavik airport. 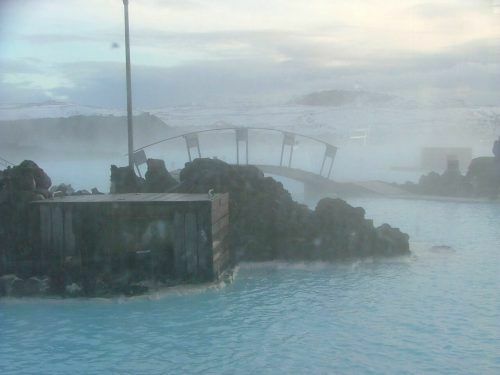 Many people visit the Blue Lagoon on the way to the airport eg on their last day. I have done this option twice. You bring all your luggage and get on the shuttle bus from your hotel to the blue lagoon. This takes about 30 minutes depending on how many hotel stops. When you arrive one at the Blue Lagoon one of the first things that you will see is a luggage storage area. You can then put your big case etc in here. Once you have visited the lagoon you can then take a shuttle bus to the airport. This bus takes about 25 minutes. 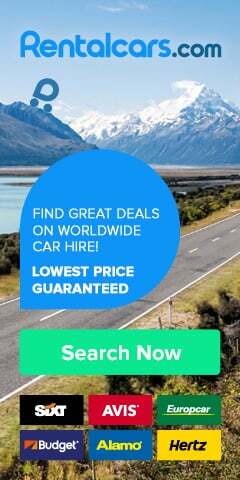 You could also visit the Blue Lagoon on arrival into Iceland by taking a shuttle bus from the airport, storing your luggage and then heading into Reykjavik. 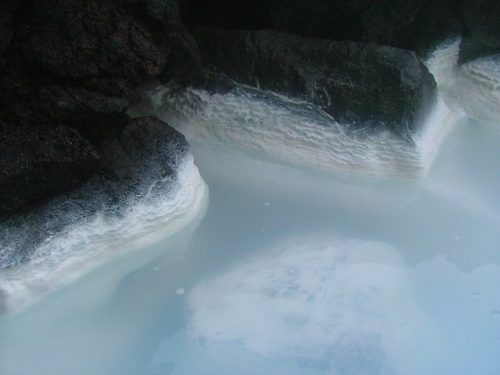 The Blue Lagoon is also an easy day trip from Reykjavik – back and forth on the shuttle. Finally, we had stayed in Hella the night before our Blue Lagoon visit on my third trip. 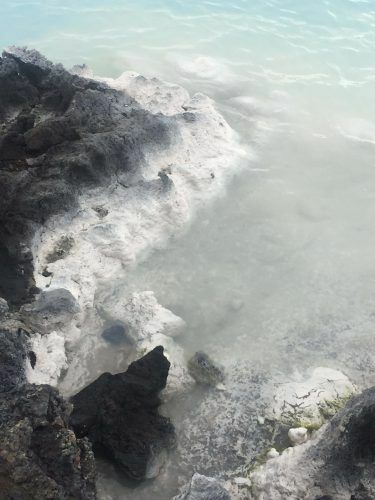 It took just under 2 hours to drive to the Blue Lagoon. We checked into the Northern Light Inn by 1115 and then got the 12 pm shuttle bus to the Lagoon. We had lunch booked for 12 pm at Lava. This took about 1 ¼ hours for 2 courses. We then checked in at 115pm and got into the lagoon. We stayed in the lagoon for quite some time! I got on the 1715 shuttle bus back to the Northern Light Inn. We stayed the night there and then drove to the airport in the morning. As I have noted several times the blue lagoon gets very busy!!! Reception is at its peak on the hour as this is the basis of your ticket. If you arrive at say 15 minutes past the hour you will find much shorter queues. This will not impact on how long you have in the lagoon as you can stay for as long as you like. The Blue Lagoon is also open in the evening. On my fourth trip, I plan on exploring this option as I imagine it will be much emptier and could be more magical in the dark. There is also, of course, the option of having dinner at the lovely Lava restaurant. If you have done this do comment below on how you found the experience!